Australian alt-rocker Paula Punch has released her new official single, “Move Over.” The track comes on the heels of her popular December 2018 single, “Tonight,” August 2018 track, “Holy Water,” and her debut LP album, “Don't Look Down,” which also dropped summer of '18. Like the rest of her rapidly growing repertoire, “Move Over” has been proudly published on the Punch Park indie label without strings to the corporate music industry. Bluesy, rocking, and featuring a root-pure blend of acoustic and clean electric sounds beneath raw, heartfelt vocals, “Move Over” is the latest example of Paula Punch's rise skyward . Sydney's Paula Punch has cited as influences Annie Lennox, Joni Mitchell, Chrissy Hind, Francoise Hardy, Bob Dylan, Ed Kuepper and Ron Sexsmith. Paula Punch's style has range, moving from release to release with occasionally startling alacrity, and she has hinted that she expects her body of work after “Don't Look Down” to shift. If “Move Over” represents this change, it's one toward classic blues rock more than toward her more '90s alternative tendencies, as the above roster of legends suggests. In any case, captained by Punch's strong, yet unassuming vocals, and backed by poppy bass lines and subtle, '60s-style organ chords (think Monkees) “Move Over” by Paula Punch showcases her uniquely natural songwriting and tasteful studio production perhaps more than ever. This theme of feminine empowerment is one which runs throughout the Punch catalog. This makes sense, seeing as how Punch writes music organically and often gets inspiration from her own experiences, which happen to run in this vein. Punch also sings for her live band, The Fireflys, featuring Robin Gist on electric guitar, Marko Simec on keyboards, Mike Rix on bass and Tim O’Driscoll on drums. The Fireflys will perform at the “Move Over” launch party at Django Camelot 7 February 2019. 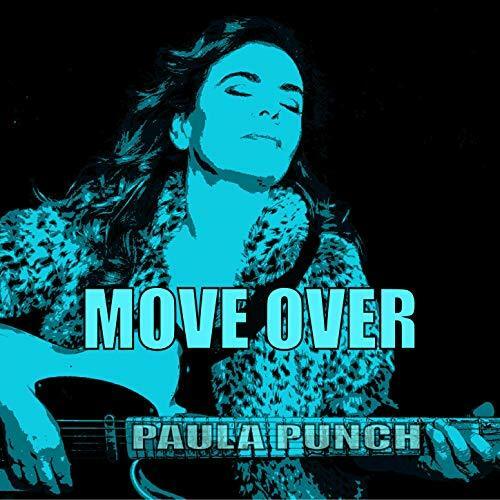 “Move Over” by Paula Punch on the Punch Park label is available from over 600 quality digital music stores online worldwide now. Get in early. Very early.